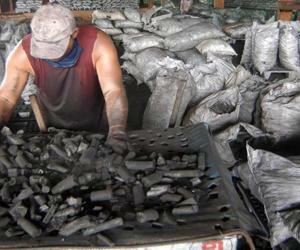 Some 210,000 tonnes of charcoal shipped Ciego de Ávila to Europe in just over a decade with the aim of improving the Cuban economy and increasing financial capacity for industrial plans and agriculture. The initiative is supported by coal producers from several provinces and is led by the Agroindustrial Ceballos Company, the national leader in this task, its director, the engineer Wilver Bringas Fernández, told ACN. The woodcutters are contracted by that entity and elaborate the coal basically with marabou, whose commercialization is carried out by Cítricos Caribe S.A. To countries like Italy, Greece, Portugal, Saudi Arabia, Spain, United Kingdom and other nations of the Old Continent. Bringas highlighted the effort of these men, who work at any time and always look for the best plantations of the thorny plant, which translates into an exportable product that meets all its quality indicators and provides foreign exchange. Florentino Delgado Martínez, a specialist in agriculture, said that Italy was the first to acquire this type of Cuban fuel, which then spread to other nations because of its extensive demand. He pointed out that this fuel began to be exported in search of an energy source that does not damage the environment and, on the contrary, it is so abundant that in Cuba there are approximately one million hectares infested with that weed. The marabou, he added, does not need sowing, cultivation, irrigation or fertilization, as cattle are responsible for expanding the "devil's thorn" with their excreta. On the other hand, innovators and rationalizers of the Agroindustrial Ceballos created at the end of last year a machine to benefit and to classify this type of fuel, which humanizes the work, increases the efficiency and discards the impurities.